I learned about Bavay during research on the first weeks of the First World War for my journey through Belgium and northern France. British and German troops passed through the town following their first battle at Mons. Looking at a map I noticed the spiderweb like pattern of roads around Bavay and got interested. The national and departmental roads that meet at Bavay run straight for many kilometers. They are named Chaussée Brunehaut after the early medieval queen Brunhilda of Austrasia. She is credited with repairing the old Roman Roads within her realm at around 570 AD. The area northern France, Belgium and western Germany back then was the heartland of the Franks. When the Franks took control of the area however, it already had a Roman history spanning about 500 years since Caesar’s conquest of Gaul. The extensive network of long-distance roads was a major part of the Roman heritage. Bavay, or Bagacum in Latin, was one the administrative and economical centers of the Roman province of Gallia Belgica. The roads that met at Bavay connected it with what is today Boulogne-sur-Mer – the major Channel port, Cologne and Trier in Germany as well as Reims. Ultimately, Rome could be reached on these roads. After the fall of the Roman Empire, not all of the roads were maintained. The early maintenance that was led by Brunhilda probably helped that the Roman roads around Bavay stayed relevant throughout history. When I drove to Bavay last year, the straight Chaussée Brunehaut leading to the city was noticeable even though I knew what to expect. In Central Europe you should not expect straight roads as a default. Often there is some piece of history behind it when a road lacks bends and curves. All these Chaussée Brunehaut meet at the small place in the center of Bavay, the Place de Charles de Gaulle. 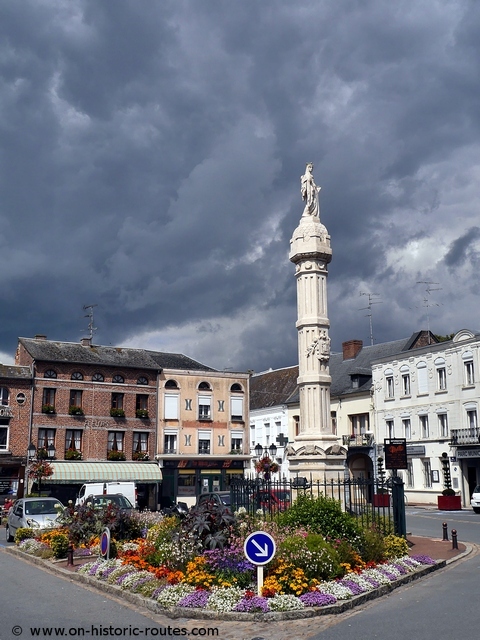 Here, a white column with a statue of Brunhilda on top stand as a symbol of the heritage of the Chaussée Brunehaut. The sides of base of the column indicate the destinations of the roads leading away from Bavay. This 19th century column was built to replace previous monuments. The tradition can be traced back to the 16th century indicating the long history of the Chaussée Brunehaut. Close to the Place de Charles de Gaulle, a wide open area stretches below the church of Bavay. Walls, arches and pillars are all around a open area about 200 meters wide. these are the remains of the Roman forum of Bagacum. 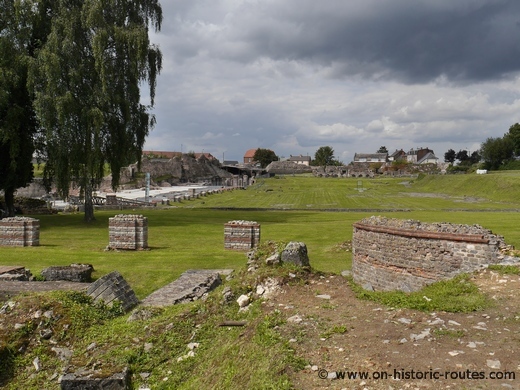 Compared to the Place de Charles de Gaulle – the current center of Bavay – the Roman forum is huge. Ruins of the Roman forum of Bagacum, few meters away from today’s center of Bavay. People have been aware of the Roman heritage of Bavay but the extent of the ruins only was discovered after a German air raid in 1940 during the Second World War. The size of the forum and the number of roads leading to Bavay indicate that the small city of Bavay was an important place during Roman times. I left Bavay on the route the armies in 1914 continued their march during the invasion of France. The road towards Le Cateau continues straight across the rolling hills of northern France for more than 50 km. It is still called Chaussée Brunehaut. A fascinating piece of heritage going back 2,000 years.